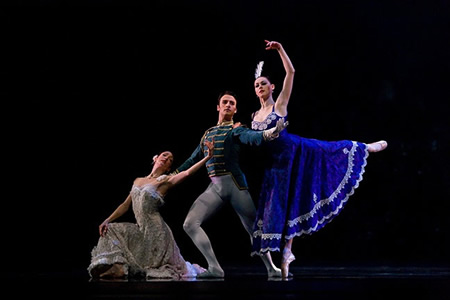 San Francisco Ballet offered something for the funny bone and something for the heart in its fourth program offering of the 2009 season. First the heart. Antony Tudor’s 1936 masterpiece “Jardin aux Lilas” (“Lilac Garden”) stepped out on the San Francisco stage for the first time, a belated but welcome premiere. Set to Ernest Chausson’s “Poeme” for orchestra and violin (David LaMarche conductor, Roy Malan, violin soloist), it is a love story as rife with regret as a lilac bush is redolent of scent. A woman, about to be married, attends a pre-nuptial party at which her lover and her fiance’s former mistress are also present. As the couples dance in and out, whispered words are exchanged, always with a look over the shoulder to see if anyone is watching. Connections almost made are missed and, in the end, everything is as it should be, except for a couple of broken hearts. The fabulous Lorena Feijoo plays Caroline, the bride-to-be and, for some reason, the only character in the work to be named. Feijoo, known for her wit, proves here that she can project the vulnerability and longing of someone caught up in events over which there is no control. She longs for her lover (Ruben Martin) as he does for her but The Man She Must Marry (Pierre-Francois Vilanoba) is possessively present. His former mistress (Sofiane Sylve) is imperious as the feather in her hair, echoed by her raised arm. She flirts with the other men but clearly still stakes a claim on the bridegroom. In the end, as the engaged couple take their leave – as they must – she simply shrugs and walks away with two spare cavaliers. Donald Mahler, who worked with Tudor, staged the ballet (and beautifully) against Peter Cazalet’s brooding bower of a moonlit set. Jerome Robbins’ “The Concert (or, the perils of everybody), billed as “A Charade in One Act,” is a hoot. A send up of concert attendance, other ballets and people who take their art too seriously, it featured Sara Van Patten as an overwrought drama queen, Pascal Molat as a cigar-chomping Groucho Marx-type who fancies her and Erin McNulty as his very proper wife. Plus an assortment of others that included the ultimate aesthete, a couple of disruptive matrons and a shy guy who gets pushed around by the more belligerent members of the audience. Even the pianist (Michael McGraw) gets into the act. Set to the music of Chopin and designed by that master of the macabre, Edward Gorey, it takes you into the imagination of the listeners. Butterflies appear in the Butterfly Etude, umbrellas come out for the Raindrop Prelude. Cossacks stomp and ladies swoon. Murder is contemplated and mayhem ultimately reigns. If you ever doubted that dance could be funny, think again.